Several roads will remain closed overnight. It is very important to be mindful of the road closures. Just because it appears as though the road looks safe, that does not mean it is. Debris and mud become a forgotten secondary hazard. Please drive carefully and avoid hazards which could turn an ordinary drive into a rescue. N. Gene Autry Trail between I10 and Via Escuela is closed. South Palm Canyon at Murray Canyon is closed (Due to the one way in/out emergency services could be delayed). Highway 111 closed in both directions. N. Indian Canyon north of Tramview Road is closed in both directions. S. Farrell Drive south of Ramon Road is closed. 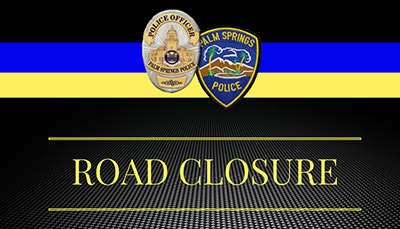 S. El Cielo Drive south of Ramon Road is closed. Golf Club Drive is closed at Tahquitz Creek. Baristo Road at S. Indian Canyon is closed. E. Vista Chino between N. Gene Autry and Cathedral City is closed. Palm Springs Arial Tram is closed. Araby Drive at the wash is closed. The Palm Springs Police Department would like to thank everyone for their patience.